Take it from someone who's been following the Tour for 30 years, this one was special. If you haven't seen it, or even if you have, make sure and catch (Tivo, tape...) OLN's recap show next week or buy the World Cylcing Videos dvd when it comes out. It may not have been quite as exciting as the '89 LeMond comeback victory over Laurent Fignon, but it's right up there. Definitely one of the great sporting events of my lifetime. The circumstances surrounding the American Tour winners, Greg LeMond, Armstrong, and Landis are uncannily similar and beg the question "what's next for Floyd?" We know that he's having his hip replaced, so we begin with a 100% chance that it won't be a run-of-the-mill story already. Le Mond, like Armstrong, was an ultra special athete at a very young age and could have won more tours if not for politics and adversity. He probably had to give one up in order to help his teammate, Bernard Hinault, win his fifth. Then he had to race against his teammate to win his first. Instead of this leading to a string of victories, it was the set-up for an amazing comeback. LeMond was accidentally shot while hunting during the offseason, nearly died, and defied his doctor's predictions to come back to bike racing at all. When he did make it back, he was terrible; often not even able to finish races. In the '89 Giro d'Italia--two years after his accident--he fought just to finish within the time cut. But his hard work paid off and by the end of this tour he was keeping up with the leaders. That year, he won probably the most amazing Tour de France in history by 8 seconds. The next year he won again. Next is the Armstrong story which is now a household tale in the US. The youngest world champion in history; Armstrong was never a complete rider until after his bout with cancer. During his first tour victory, he didn't have to compete against the best riders of his era, leading to a lot of "what if?" talk that created a massive amount of press for his second tour. Enter Landis. Mennonite upbringing who used biking to escape. He had enormous talent but needed to learn how to live in the real world, something that probably slowed his rise into the top ranks, which he enters in order to work for Armstrong. He leaves the Postal (Lance's team) in order to have his own chances to win and when he finally reaches his peak, the race is filled with controversy and his hip gives out on him. It's bizarrely coincidental. As for his future, we have no idea. In theory, his hip should be fine. However, it will still require everything to go well, a long rehab process, and probably just a bit of luck because even though a hip replacement is a simple procedure these days I don't think it's been tested when the patient has needed to return to world class athletic form. Beyond this, we've still got the "what if?" question. Jan Ullrich, Francisco Manecebo, Ivan Basso, Alexander Vinokurov, and Alejandro Valverde all didn't race because of either doping scandal or crashing out. When they come back--of if, in some cases--the race is going to be different. Which is exactly what everyone said after Lance's first victory. This means, basically, that next year promises to be fantastic and that you should become a cycling fan. So order OLN, bookmark Cyclingnews and Eurosport and, most of all, buy yourself a bike and get out there. Maybe someday, you'll even ride the Tour de France. OLN is changing their name to Versus next month (probably since it's hard to tout Survivor and weight lifting as outdoor sports) but they seem to started this combative attitude against T-Mobile during their tour coverage. Is this a corporate thing, or do they dislike Germany? It must be the former, since they don't slam Gerolsteiner. Anyway, it's pretty irritating to watch this since T-Mobile lost their best rider and still fought their way to a podium finish and won the teams classification. Normally, this would be reason for some praise. Instead, we get Al Trautwig saying "I've just gotta say that I, for one, am really sick of seeing T-Mobile do well." WTF? The other guys weren't quite as blatant but their subtle stabs at every opportunity and OLN's glaring omission of the team classification podium at the end of the race (they showed all the others, even "most combative rider") showed us that maybe versus is going to stand "our version of the world versus anyone we don't like". Okay, whatever. But I, for one, am really sick of seeing biased race coverage. Hey Al, how'd your beloved Disco Boyz do? Did they quit the race, because the only time I saw their jerseys were when you were hyping them? Does this guy sound to you like part of an evil empire of cheaters? addition: my friend Reed just clicked his mouse a few times and discovered that OLN is owned by Comcast, who own AT&T, one of T-Mobile's direct rivals. This might have been the best bit of bike racing I've ever seen. Certainly, since 1989 when LeMond and Fignon battled it out in a Tour that was decided by 8 seconds. Fignon, incidentally, criticized Landis the other day for lacking panache. Well, I reckon this is what he had in mind. We haven't seen this type of stage in the Tour since the days of Merckx. Not from Armstrong, not from Indurain, not from the Badger or Fignon himself. I'm tellin' ya, if you haven't seen this race go find a TV today and watch it. I won't even talk about it except to say that at the finish, there were tears running down my face. If you don't like this, you don't like sport. Oh my God! That was an amazing stage. Who could have guessed: the man you looked invincible cracked, two riders allowed to escape earlier in the race would still be riding with the leaders, the two teams that lost their leaders on the eve of the race are still dominant? Amazing. This is why, after all the media, marketing, science, posturing, etc, we still get out there and race. So Landis cracked, big time. And make no mistake about it, his team had nothing to do with it. The only way they could have helped him was if they were allowed to push. I don't know what happened but it looked like a bonk . Once you bonk there's not much you can do. Perhaps he didn't take in the food or drink he needed, which is one of those things you never know until it hits you. Then it's too late. Whatever the reason, a guy who could beat me pedaling with one leg was riding up the final climb slower than I would. Something went seriously wrong. Hats off to Pereiro and Dessell. They may still crack but they've taken the gifts given to them earlier in the race and given them a serious run around the block. Pereiro, a decent time trialist, is now a threat to win the race. And AG2R, always a also ran team in the Tour, has now become a major player. It's been so long for the French, they must be beside themselves. And great team is, well, a great team. Caisse d'Epargne, CSC, and T-Mobile all lost their leaders and are still filling up the podium. You could have won some money betting on this last week, that's for certain. The favorite now has to be Kloden but, after today, who could possible predict anything? It's a race on its head, wide open, and I can't wait until tomorrow. Unless you've raced bikes, it's difficult to know just why having a team of riders around a chosen leader is an advantage, especially in the mountains. On the flats, the pack moves so quickly that there is an obvious advantage due to the wind created by the speed of the riders. Add wind, especially when blowing in your face or side and knowing that teammates can shelter you makes it pretty obvious. In the mountains, it's less clear and, frankly, far less important. Going up hill you don't create enough wind to have someone else matter much. Someone in front can still help, for sure, but it doesn't need to be a teammate since you generally ride about as hard as you can so you can take anybody's wheel and there isn't much they can do about it. On mountains, you usually see riders from various teams working together in a survival mode.Where teammates can be an advantage is by attacking one rider. This, however, requires that they are strong enough to try. If the pace is low, a team with a numbers advantage will launch guys and force rivals to chase. However, this advantage is easily minimized if one rider is the strongest because he can ride harder which won't allow this strategy. On descents, it's different. A pack can move quicker, especially if the descent isn't too technical. But on narrow and twisting descents, it's often an advantage to be alone. Today's stage--still in progress--is a great lesson in pack dynamic. 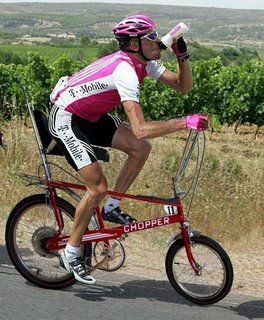 Levi Leipheimer looks to have made an outstanding move. He attacked far from the finish, which is usually suicidal. However, because all the terrain is up and down and the descents are very windy, the pack won't get much of an advantage and if he's got the juice, he could be able to gain a lot of time. Again, the OLN guys have made a big deal about Phonak lacking guys while T-Mobile has a bunch. Given the terrain, this is exaggerated. If those T-Mobile guys are strong, they should attack and make Landis follow. If they fail to do so, they have no real advantage because Landis can follow any wheel he likes. They are making a big deal about a possible mechanical problem but it's a rouse because the race leader's team car gets to ride at the front of the caravan (it goes by place) behind the leading rider on their squad. This means that the Phonak car is directly behind Floyd. If he had a mechanical he'd have a new bike in seconds--just as quickly as if he had a teammate, plus he'd have the right bike since his car has one, and maybe two, exact spares. Oh, and Michael Rasmusen is again winning the mountain jersey. Yesterday, he stayed back to work for his teammate. Today, because his teammate doesn't really need him, they've let him ride ahead for points (as he's so far back on GC he'll be let go). It is possible--and likely--that if Menchov feels good on the final climb they will instruct him to slow down and help. If not, Rabobank lets him go for the stage, which is highly prestigeous. Now I'm back to root for Levi. This is his big chance to get back into the GC picture. If it works, his move showed the type of panache the Tour is all about. Then maybe then we could see Landis at least breathe hard. Today was ridiculous. Landis just follows every move, easily, with his "you'd better go faster now because I'm going to smoke you in the time trial" candor. So, it appears, the race is over. The next two days will be interesting but I'd say that Floyd's in total control. You can attack and attack but you've still got to have the riders that can hold it. CSC had a nice race. Expect more of the same from them, and probably Cunego, but they still can't win. Of course, there is plenty more to watch than the race for the yellow jersey. The OLN guys were insane again today. Someone was talking about Floyd being isolated for the last 40k of the stage. Umm, you mean except for Merckx who paced the leaders for about a third of the climb? Then Floyd says the only guy he had trouble following was his own teammate at the base of Alp d'Huez. Insane. A what's with Robbie Ventura? He's like a stamped out version of Armstrong's "coach" Chris Charmichael. TV loves their yes men. Like Carmichael, Ventura is ultra postive to the point of being absurd. The other day he said Floyd, for sure, wanted to keep the jersey only to watch him give it away in forcable fashion the next day. I'm sure, a la Lance, at some point we'll all know his real trainer is some nefarious Italian scientist. And, hopefully, not just for the Tour as I plan to finally get a heap of exercise in. I'm grading my challenge D, since I've been resorting to swimming and hiking with kids to get all of my exercise in. I've been friggin' busy and it's been friggin' hot. At least I've been on my bike a lot. Hopefully, I'll reverse this during the final week. Anyway, I'm pretty psyched about tomorrow's stage to L'Alpe d'Huez. It's going to be epic, well, hopefully. I think by tomorrow we'll have a very good idea about who our winner will be. Or not. I mean, if someone like Leipheimer or Menchov gains time, the race is wide open. But if Landis again easy covers each attack then I think he'll be able to do this throughout the alps and, if he gets to the final time trial close to the lead, he'll win. I won't go into who I think will fill up the podium. I don't think it's a secret. Both cyclingnews and velonews have features on this. But if you saw the last mountain stage, you know who the players are. It's pretty wide open at this point. I don't care who wins. I'm hoping for some fun racing. Okay, I'm pretty sure that I don't know nearly as much about cycling as Paul Sherwin and Bob Roll, who were ex-pros, or Phil Liggett, who's the only Tour de France announcer I've heard in my lifetime (and I've been following the race since I was a kid.) However, listening to these guys talk it's apparent that there are marketing influences behind what they're saying. I'm guessing it's OLN, harping on them to say things to liven up the race (even though this edition is plenty full of life), but the stuff that's coming out of their mouths is often just nonesense. For example, the "inability of Phonak to control the race" is something they talk about daily, especially since they purposefully gave up the jersey the other day. We hear Lance would have done this or that and "no way the Discovery Team would have allowed that to happen" yada yada yada and it's almost as though they never watched Lance race. 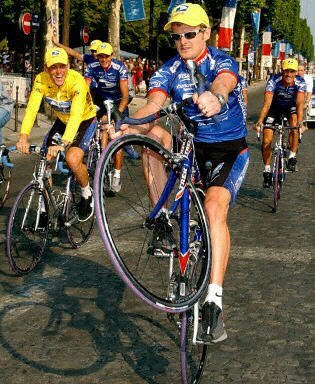 I mean, when Thomas Voekeler bravely defending the yellow jersey for days on end in 2004 his biggest cheerleader was Armstrong. 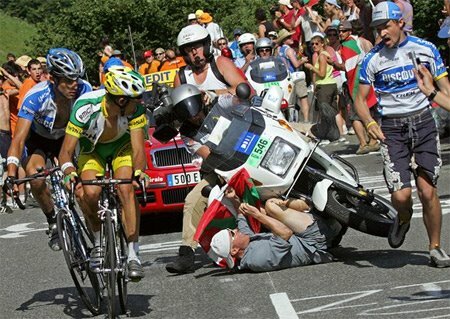 It's better to not have the yellow jersey if the person wearing it isn't an overall threat. No one disputes this except just about everyone in the American mainstream media. Cyclingnews.com was even more honest about Pereiro, saying "Grabbing the jersey is somewhat of an overstatement as Phonak almost forced him to take it." Yet OLN won't shut up about how "Phonak is vulnerable." Yet, watching Pereiro's Caisse d'Epargne boys working all day in the heat while Floyd's boys sat in the autobus resting for the alps, I'm thinking Phonak is employing some very sensible strategy. This is just one example. I really used to like Phil, Bob, and Paul--and still do, even if it's now mainly sentimental--but I'm getting more and more sick of their lunacy every day. I've always blamed all this on Al Trautwig, but this excuse is beginning to wear itself thin. Anyway, Phonak is fine. Landis is in perfect control of the race. He might not win if some individual is stronger in the mountains. But he's not going to lose to Pereiro. And he's not going to lose because of his team. Bastille Day - France's independence day almost always happens on the "transitional stage" in the Tour. This is a stage where there are no big mountains, which gives breakaways a good chance of success. During the race, the peloton (the mass of riders) starts and goes about as slow as it can get away with. Some days it's SLOW, some days not, but it's always calculated and usually controlled by the team that has the yellow jersey. Whether it's slow or fast, someone always tried to attack and go off alone. On Bastille Day, the French riders usually attack constantly. However, the Bastille Day break the succeeded didn't contain a French rider who could hold the pace and was so strong the French teams couldn't bring it back. In the end, the guy who won had to attack early because his two companions were both sprinters. Discovery's Yaraslov Popovich attacked the break 5 times before he got away. Impressive. The next day, Landis lost the race lead. This was calculated by his Phonak squad who wanted to "give away" the yellow jersey. Essentially, various breaks try and the peloton, which can always move faster because of the mass dynamic and more riders available to take pulls on the front, finally allows one to go up the road and gain an amount of time. With races radios, the riders communicate with their director about who is in each break. Finally, a break with "the right elements" is allowed to go. In this case, they went far far ahead, gaining over half and hour on the peloton before Phonak started riding harder and "pegged" the break at around 30 minutes. This was enough time to give away the jersey but not enough to allow a lot of time for the new race leader to have in hand when the race reaches the alps. The break came down to a race between two of the most aggressive riders in bike racing, Jens Voight, who won the stage, and Oscar Pereiro who got the race lead. He's a great rider, but nothing in has past shows that he can hold onto the jersey in the mountains. Asked about "losing" the jersey Landis commented, "If I don't get it back then I wasn't going to win it anyway." I think this was the afternoon headline in L'Equipe. If it wasn't, it must have been something like that. 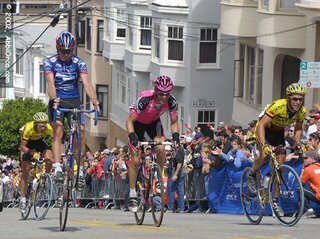 I mean, granted, I was one of first people on the "Hincapie is not going to win the Tour" bandwagon but, still, the Disco boys rode better times when they were on front the entire race working for the Texan. Bizarre. Leipheimer has been left for dead and making odd sounding excuses along the way. All of a sudden, he's attacking everyone in sight and three Gerolsteiner's are beating the best Discos. Other than that, not much enexpected happened. Landis looks the strongest but, as a follower in the mountains with bigger hills to come, it's doubtful he'll be able to put things away before the time trial. A big climbing day by any number of of guys could still turn the race on its head. Expect every Frenchman in the race to attack tomorrow. Congrats to Landis, Menchov and especially for Dressel for choosing to defy the odds and defend the yellow. He put up a spirited fight and almost made it and, I'm sure, I'm not the only one who wished he had. Landis didn't want the jersey just yet and I think they'll be happy to let breaks go up the road tomorrow. Today's the first big day in the mountains. However, with the finish over 40k from the top of the last climb, not too many hands will be revealed. It's a day where you can't win the tour, but you can lose it. There are a couple of guys off the front that are going to take the yellow jersey, which doesn't much matter to the real contenders. That usually sounds strange to the people I talk to, so today I'll break down the race and how it works. GC - is the race for the general classification based on overall time. This is what Armstrong won, the yellow jersey, and is the main prize. A GC rider is protected by his team during the race and should only need to shine at two points when he can no longer be protected: in the high mountains and on individual time trials. Points - is the green jersey, the sprinters prize. This goes to the most consistant rider, place wise, as opposed to time. Because most of the stages are flat-ish, the people who can sprint out of a group win this prize. Teams matter during this prize, a lot, as a strong leadout from your team can greatly aid a sprinter. Since the sprinters generally can't climb, you'll see them gather together to try and support each other over the mountains (called the autobus, or just bus) where they need to survive to the finish in under the time cut. This isn't always easy. The green jersey wearer often fails to get over the mountains in time to finish the race. Mountains - is the polka dot jersey for the best climber. It's usually not for the best climber in the race, but the most aggressive climber. The very best climbers are usually in a tactical match for the GC, so any climber who either doesn't fancy their GC chance or plain can't time trial, will try and win this. To win the mountain jersey you have to be aggressive and ride away from the field early on long mountain stages to get all of the points on the early climbs. Each rated climb has a point value which increases as you go deeper into the race. In order to win this jersey, you need to gain most of the points on the early climbs, meaning the wearer of the spotted jersey has to spend many kilometers alone in front of the race, expending massive amounts of energy, and then hold on and stay in time contention the rest of the race. ouch. Young rider - the white jersey is for the best placed young rider on GC. Most teams have a dedicated GC leader and don't really work for this prize. Therefore, there's rarely too much drama surrounding this but it's always an indication of who to watch out for in the future. Often times this winner comes from the lesser squads as the power teams have all of their riders committed to working for their leader. So, today, all of the GC contenders are happy to sit and watch each other and let a breakaway go up the road. This calculated gamble has often led to surprises in the race. 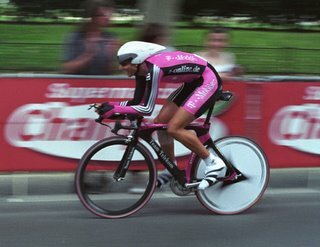 In 1990, Claudio Ciappucci and a small group gained 10 minutes and wasn't caught until the second to last day of the race. 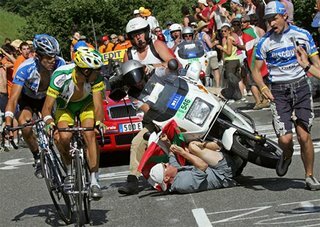 In '04, Thomas Voekeler did the same thing and held the jersey for nearly half of the race. This is what's playing out today. A two-man break is gaining nearly 1o minutes. Cryil Dressel is going to win the moutains and the yellow jersey but Juan Migel Mercado is more dangerous as a GC threat. Tomorrow, Dressel will probably attack again an try to get more mountain points but Mercado, a good stage racer, could sit with the leaders and try to gain the yellow. He may be able to get it and hold it for a while. 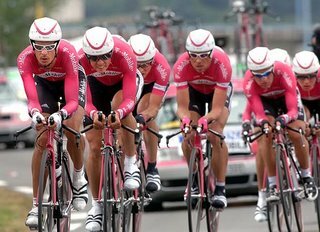 As the GC riders go, T-Mobile with a reduced squad, probably doesn't want the jersey because working for it is hard work on the team. So what we saw was posturing. Tomorrow, there will be no hiding so today all the riders are trying to look cool and gain some type of psychological advantage going into the first monsterous mountain stage. If you were watching, notice Landis riding with his jersey zipped all the way up while his teammates--and most of the field--were fully un-zipped and gasping. This is posturing. "You think this is hard? I'm barely breathing," kind of stuff. When I said you can't win but can lose, I think Levi has lost it. He hasn't said what, but something is wrong. If you lose the leaders over today's climb, your GC chances are over. Same with Iban Mayo and yesterday's leader, Gonchar (btw, his name is G, not H as is being reported by most people because "they made a mistake on my passport"). Another interesting note, Eric Zabel made it to the front group. He's trying to win his seventh green jersey but, at 36, no longer has the legs to win the big sprints. But crafty riding can gain points where most sprinters dare not go. He and Daniel Bennati made the front group and got a few points. If they can continue this they could sneak up on the leaders. Chances are, this won't be enough to win the competition unless McEwen and Boonen don't get over the mountains but that's happened before. And it's always interesting to watch big sprinters try and hang with the waif-like climbers in the moutains. So today we didn't learn much but the race got more interesting. Tomorrow, we'll know who's got a chance to win. To me, the best looking three are Landis, Kloden, Evans. All the Discovery four look decent too, so look for them to attack, along with Giberto Simoni, for sure. Now I'd better get on my bike. Well, damn, I had a great post on the World Cup written here but then my internet connection began to go on the fritz and I lost it. Hopefully, that inspiration will come back to me but now I'm just irritated so, today (from my local coffee house), I'll post on the most irritating aspect of the Tour de France. But first, my challenge. My grade on the first rest day is a C-. It's been good as an overall life commitment but my "training" has often consisted of bike commuting between various bars and restaurants for the World Cup matches. But, given the cup has finished, as well as all of my social commitments (like a mad 30-hour Video Shop renunion in Vegas), I reckon it'll get better. And, despite all the reverie, my fitness level went up, not down, over the course of the World Cup; something I'll guess is a rare event world-wide. Maybe only me, Ronaldo, Luis Figo, and Zidane. So, for sure, the worst (of many many many) commercials during the Tour is the Flomax ad. You've heard me rant on this subject before; drugs that advertise side effects far worse than the problem they're claiming they "may" be able to help with. In this case, it's "frequent trips to the restroom(sic)" or some such nonesense. I mean, sure, that could be a problem. It could even be quite irritating. However, I'd far prefer it to the list of side effects promised, one being frequent fainting. The funny thing is that the ad shows guys fishing, golfing, handling heavy machinery and being generally active which, seems to me, is the exact kind of place you wouldn't want to be fainting. But, hell, what do I know? Perhaps a quick nod off in the middle of fighting a marlin is preferable to needing to take a whizz. "Surprising Day at the Tour"
Not exactly. But to listen to the OLN commentary or read any American news source it seems like it was a shocking day, and mainly because George Hincapie didn't win. But, really, was there anything in his past other than his relationship with a certain Texan that showed his might? Um, no. One shocking thing was the poor performance of Levi Leipheimer. I don't think anyone expected this and, in fact, I don't think he's ever ridden anything close the this bad a time trial. After two top 10 Tour finished and in a year he's supposed to be peaking, it seems to point to something being quite wrong. We'll see in the days ahead. Another is the crash of Bobby Julich, who now holds the unprecidented distinction of crashing out of the Tour twice as a team leader (if de facto this time), in time trials, something normally thought of as safe. The only explaination that I can find for this is that perhaps thinking he'd be there to support Basso in the mountains, he didn't recon the time trial courses because he didn't think he'd be allowed to ride hard, and was therefore unaware hidden curb that seemed to cause his accident. But, man, even with the crash, it was still pretty much bad luck to be forced out of the race. Other than that, today was filled with proven time trialists having good performances. The "completely unexpected" winner, Sergie Gonchar, wouldn't have been so unexpected had he not come to the race to ride for Jan Ullrich (who must be beside himself seeing how his team performed today on a course that perfectly suits his talents). After all, he's won a stack of time trials over the years and held the lead in the Giro de Italia. Rogers, Lang, Landis, etc, etc. were all expected to do well here. Landis was the big winner for the day, moving into the clear race favorite. Kloden proved to be fit as well and is now, "suddenly", a contender. Other proven guys had solid rides, mainly GC threats Evans, Menchov, Sastre. Some of the best climbers, like Rujano, Mayo, and Simoni lost a ton of time which will, undoutable, lead to many attacks, fireworks, and a fun time in the mountains. Who of the favorites will be able to follow? As for Discovery, they now have a clear leader, 2-time Giro winner Paulo Salvodelli, and a great team to support him. But what does this do to the American coverage? The way OLN's been reporting, it's not far fetched to think they might just throw in the towel and get back to bass tournaments and shooting things. How can we sell a race to the American public without a a movie star mug with a podium girl wife? Landis is more like that kind of working-class hero the French would rally behind. We certainly can't broadcast something like that! I'll post my own thoughts on this at some point but this is very interetsting and explains, rather well, some of the misconceptions with doping. I do ask you, if these riders are the only ones doping than wouldn't they have had some quantifiable shift in performance that could easily be graphed? Doping, by definition, is performance enhancing (makes you go faster). Yet, there is no evidence of this sort. This either means that no one dopes, which seems unlikely in the face of these allegations, or that everyone does. There is truly no other explaination when you look at the numbers. The problem, perhaps, is that what is actually doping is misunderstood. Fuentes: "Tour at that speed impossible without doping"
In an extensive interview broadcast by Spanish radio Cadena Ser, gynaecologist and doping expert Eufemiano Fuentes has talked about his behind-the-scenes activities in the sport. First of all, he insisted on his belief that he was not a criminal and only attended to his medical duty of preserving the athlete's health. "I'm don't feel like a criminal; I haven't killed anyone and I haven't destroyed anyone's health," he said. "I'm a health professional; my priority is to cure my patients because I think that the sport at high level is not healthy. I'm accused of crime against public health, but they should sanction those who play at being doctors." So instead of boosting the rider's performances, Fuentes considered that he only "supplemented and adjusted" those bodily functions of the riders which showed a deficit. "[Cyclists] are very special sportsmen because they reduce their heart rate by half when resting," he continued. "Their hearts are big, and when they stop cycling their hearts reduce their size to normal within six months, which results in what we call 'sudden death'." 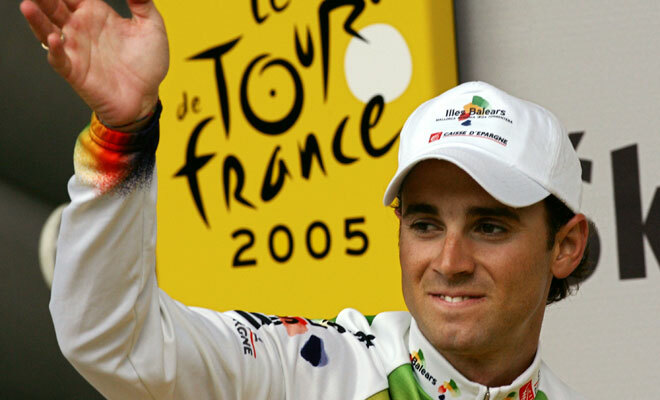 Fuentes, who added that his treatments also concerned other sports than cycling (football, tennis, athletics), said that it was possible to ride the Tour de France without "medical" help, but not at that speed. "You just can't ride four of these mountain stages successively at that speed, it's very harmful," he said, adding that in his opinion it was more dangerous for a cyclist to start the Tour de France with a hematocrit level of 31 percent, than one of 51 percent - even though this meant that the rider would be excluded from competition. The Madrid-based doctor named two cyclists, Alberto Contador and Vicente Ballester, but only to say that he did not know them and that he did not know why their names were on the list established by the Spanish criminal investigators. He also said that there were riders still participating in the Tour de France that he had treated and that he "had enough of the hypocrisy. The Tour direction sent home riders that I never treated, and there are now clients of mine in the peloton. I'm furious. People were named that I don't even know but other names were concealed." Moreover, he stated that the bags of blood that were found were destined "for use in the next ten years", and that the quantities of EPO seized "for a family member who might need it." he also added that he had been threatened not to reveal any persons involved with him. Fuentes felt "lynched by the media" and "killed professionally". German press agency dpa has reported that Gerolsteiner team manager Hans-Michael Holczer had confirmed information according to which his Tour de France leader, American Levi Leipheimer, had possible contacts with controversial preparatore Michele Ferrari. At the start of stage five in Beauvais, Holczer admitted that Leipheimer had stayed in the same hotel during a training camp on Spanish island Tenerife last year. "But he assured me once again that he isn't working with the Italian," said Holczer. 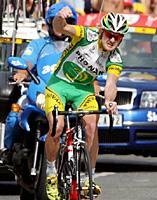 Since I'm writing this at the rather crazy hour of 5am, it seemed like a good subject would be the craziest rider in the peloton, Floyd Landis. I think going from a normal amount of exercise to heaps of exercise is wreaking havoc with my sleep. The last couple of nights I've woken up early, even though I'm quite tired. It's either that or the World Cup reverie in combination with the exercise. Still, I'm already over two hours behind my Tour challengers; nothing a couple of long days in the mountains can't fix. I bring this up because as I'm laying in bed I'm wondering what Floyd might do, which is probably just get up and start training. With the top riders riders from last year's Tour all out due to retirement (Armstrong) or doping (Ullrich, Basso, Mancebo), or lack of a team due to doping (Vinokorov) along with the pre-race favorite (Valverde, crash), American Floyd Landis is now the odds on favorite to win the race. After years of calculated and professional behavior from the Texan, this may be just the shot in the arm (pun intended) that the sport needs. Landis couldn't be more different than Armstrong. Raised in a Mennonite community he wasn't even allowed to wear shorts when he first began to race his bike. His parents, horrified at the thought of someone trying to race bikes for a living, gave him so many chores that he wouldn't be able to ride during the day. So he trained at night, every night, even during the Pennsylvania winter. He'd read that Tour riders training 100 miles a day, so that's what he did. He'd train during the snowy winters with plastic bags over his shoes wearing layers of sweat pants on a lousy bike until he left home at 17 and promptly became a professional mountain biker. Thrust into the limelight, Landis has nothing to do with Armstrong's entourage or the Discovery team's clinical political correctness. He makes his winter home the Riverside country suburb of Murrieta, a place not exactly associated with the rich and famous. During the season, he lives in a dingy $700 a month apt. He's brash and says whatever's on his mind. When Armstrong's association with Dr. Michele Ferrari came up in the book, Lance Armstrong's War, most of the Armstrong circle gave measured responses about the association, pointing to Chris Carmichael, OLN golden boy touted as the man behind Armstrong by the US press as an important component's. Ferrari, unquestionably one of sports most brilliant minds, was not the type of character American's wanted their hero associated with because he was open and critical about the UCI's doping policy and, essentially, pro dope, calling EPO under supervision "safer than orange juice." Landis, however, laughed outright when asked who Armstrong's real trainer was. "You've met both of them," he said to the author Daniel Coyne. "Who would you listen to?" a reference obviously pointing to Ferrari. He's also tough as nails, once refusing to go to the hospital with a broken hip until it was apparent it would never heal on its own. Then, after having a bunch of bolts placed in his hip to hold it together, he was on his trainer the next week, and starting the Tour de France not long after. One of my favorite Landisisms was his response to the cliche of giving 110%. There's only one rule: The guy who trains the hardest, the most, wins. Period. Because you won't die. Even though you feel like you'll die, you don't actually die. Like when you're training, you can always do one more. Always. As tired as you might think you are, you can always, always do one more." So there's no such thing as overtraining? "If you overtrained, it means that you didn't train hard enough to handle that level of training," Landis says, his fingertip rapping the table for emphasis. "So you weren't overtrained; you were actually undertrained to begin with. So there's the rule again: The guy who trains the hardest, the most, wins." And ther's plenty more where that came from. Check out this article, for starters. Go Floyd! Oh, and btw, congratulations to France and Italy for reaching the World Cup finals. My challenge is a rather large undertaking and today it was exacerbated by more than the Tour. Add celebrations for the 4th and the World Cup semi-finals and you've got a difficult scenario for fitness. Thankfully, I live in a huge city as my commute to the various activities I was to participate in got me a few hours on the bike. I'm a bit in the red on my challenge, meaning I owe about an hour and a half. I'm tellin' ya, this will be a lot easier when the World Cup ends. At the Tour today there was justice. Mattias Kessler, who deserved to win yesterday, found the strength to attack the peloton once again and this time stayed away. His victory will hopefully take a touch of the sting out of Germany's woes over their valient loss to Italy. The Italians were superior in a brilliant match, one for the ages. Anyone who thinks "soccer is boring" needs to find a reply of today's overtime. Sitting next to a German fan down at my local, he could only shake his head at the winning goal. "That was absolutely beautiful," was all he said. It may not feel like it here in the USA, but you should believe those slogans that state "one game changes everything." Hmmm, I think this little training program I've concocted might be kind of hard. 5-plus hours in the saddle today for the boys, meaning that if I ride for 3 hours, which is reasonable, I need to do 2 hours of additional exercise. I think my social life's about to disappear for the month of July. Oh, well, it'll be fun and, by the end, I should be pretty fit. I'll perform a fit test later today and see how much I improve over the next three weeks. The last two days (and the couple prior) have all been 2-3 hours on the mtn bike. Yesterday, I was definitely feeling tired and I'm thinking "this is day 2!" Maybe I'll recover today... ha! On the tour: some fun strategy has been played out over the last couple of days. It was nice to see Big George (Hincapie) use a cheeky move yesterday to gain the yellow. Thor got it back today with some more straight forward sprinting. The race for the green jersey looks a lot more wide open than I had thought. Boonen was unbeatable during the early season but he's definitely beatable now. He went 1-1 with two straight up sprints with Husvold today before being nowhere in the finale. McEwen is on form, for sure, but it's always interesting to see whether or not he can get over the mountains. If the bigs guns falter, crafty riders who can climb, Eric Zabel and Stuart O'Grady are still in the mix and may have something to say about it yet. You can tell absolutely nothing about the yellow jersey race at this point but it's always fun to look anyway. Landis has had two glitches already. He missed the start of the prolong and lost a hand full of seconds. Today he was in a minor crash. Evans has stayed near the front and out of trouble. Kloden (notice not in my top 10 because I didn't want to gamble on his unknown form) is right in the mix. If he's at his level of two years ago he might be the favorite. You can't tell anything about Valverde right now. He's so fast he could probably win a stage like todays if he was in the mood, so maybe he's just riding smart. His only real unknown is long time trialing, so we'll know where he stands after stage nine. If he's among the leaders, look out. Tomorrow's stage is pretty bumpy. It would suit a breakaway, which I'm sure will be attempted. But the sprinter's teams are very strong so, I imagine, Husvold will try and hang onto yellow so look for another select sprint finish. The Tour hasn't even started and we've already had the craziest day in sports this year, and maybe the biggest day in the history of cycling because 58 major players, as well as the top two Tour contenders, have been implicated in a doping scandal and kicked out of the race. I'll discuss this more over the coming weeks but, for now, let's sort out what to think about who's left in the race. 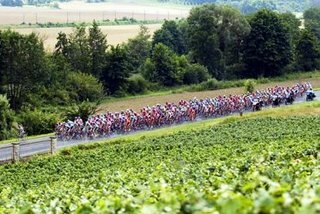 Each year, the Tour takes a different course around France, usually including a few days in another country. This year's Tour uses an old school profile that features more time trialing, less climbing, and no team time trial. If Armstrong were still in the race, this would suit him against Ivan Basso but not against Jan Ullrich. The lack of a team time trial lessens the advantage of the power teams: Discovery and CSC, meaning a guys like Alejandro Valverde or Iban Mayo don't start the race already having given up a couple of minutes. Alejandro Valverde (Spain, Caisse d'Epargne) - This wonderkid is one of the best one-day racers in the world and hasn't even began to flirt with his potential. Vegas has him the odds-on favorite but he's never won a grand tour nor has he finished the Tour de France. He can sprint and climb, a rare combination, but the oddsmakers are setting him up almost purely on potential. Levi Leipheimer (USA, Gerolsteiner) - The highest finisher from last year left in the race, Leipheimer is a solid rider supported by an excellent team who just won the Dauphane Libre. His form is there but the buzz is that he doesn't quite have the talent or team to stand on the top of the podium. Could be true but there is little doubt he'll be in the mix and has a great chance to move on to the podium. 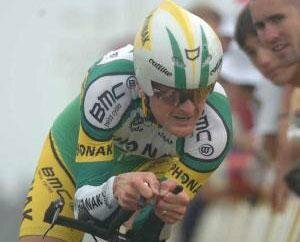 Floyd Landis (USA, Phonak) - Armstrong's former teammate has already won three stage races this year. With heaps of talent, a great team, and plenty of brashness to handle the pressure, many are touting him as Armstrong's heir apparant. Cadel Evans (Aussi, Davitamon-Lotto) - A strong finish last year and a solid build up this spring, this former mountain biker (like Landis) can climb and time trial equally well and seems well suited to this year's course. His team, however, might have trouble if forced to control the race. Paulo Salvodell, George Hincapie, Jose Azevedo, Yaroslav Popovych - Discovery doesn't have Lance but they've got a lot of cards to play. Big George showed he can win in the moutains last year but can he climb in a leader's position? Savoldelli is realistically their best shot, having won the Giro twice. Azevedo and Popovych both have finished high in major tours. It should be interesting and fun to watch them play all these cards. Wild Cards - The are many many peope that could shake up this race. Denis Mechov finished second in the Vuelta de Espana last year and seems to be improving. Both Damiano Cunego and Giberto Simoni have won the Giro. They seem to lack enough time trialing ability to win here but could make thing very intersting in the mountains. Ditto for Michael Rasmussen, who will probably go for another spotted jersey (the best climber). Iban Mayo hasn't been heard from in two years but a recent win shows he might be on form, something to consider since he's one of the few people who dropped Armstrong in the mountains. T-Mobile and CSC - With the loss of their leaders, it's hard to imane these powerhouse teams going quietly. 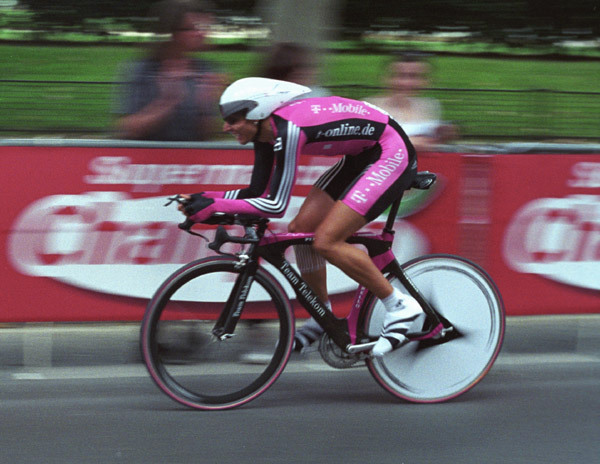 T-Mobile has world time trial champion Mick Rogers and Tour podium finisher Andreas Kloden to pick up the slack. If Kloden, who's lacked form the last couple of years, is strong, he should be a favorite. CSC will look to American Dave Zabriske to grab the yellow during the first time trial. History seems to show he'll lose it in the mountains but if anyone's strong enough to hold the jersey, it's CSC. Bobby Julich may be too old but the race profile suits him. 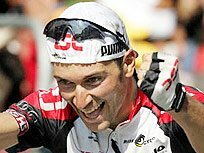 Frank Schleck could also be ready for a breakthrough year as well and Carlos Sastre has proven tough in stage races. Like Discovery, they have a lot of cards to play. Look for some creative strategy from them once the race hits the mountains. Green Jersey (sprinter) - This is Tom Boonen's to lose but look for Thor Husvold, Robbie McEwen, Eric Zabel and Stuart O'Grady to try and knock the world champion out. Polka Dot Jersey (mountain) - Depending on who tries for this it could be fantastic. Certainly Rasmussen will try again but if Gibo or Cunego don't fancy their chances for the overall, this could be epic. My new training program began yesterday. While it's not very scientific it will be hard, fun, and lead to something when it's over. I'll explain the "rules" over the coming days. For now, all I know is that it will mirror the Tour de France, which may lead to some discussion about doping in sports, something this is almost entirely misunderstood by the general public. In my chat last week, one of our members was complaining about lack of motivation. I mentioned that with the Tour beginning this week, it was the perfect time to begin a training program. This race is a great vicarious training partner because, no matter how much you may be suffering or sacrificing, you can be sure there are others out there suffering and sacrificing more. I've done a Tour training program once before. Back in '98 i mirrored the race. Because I hadn't done much bike riding and was completely off the couch, I road each day of the race but began riding only 10% of the racer's distance, which increased over time until I was riding 100% of their distance over teh final few days. This year it's going to be tougher. Because I'm training for a few different sports, I won't just be on my bike. But I will train, and train a lot. Here are the rules. 1. Train as many hours per day as the riders race. 2. Bike each day the riders ride. So I'll be back, everday for the next 21 days. Along with my training program, you'll also get my views on this year's race, the doping scandal, and why American's are so ambivilant towards the World Cup.